Incidents are an unfortunate reality for any company. They occur all the time, at any given time. In EHS management, an incident could be said to be any unplanned or undesired event which occurs and which may cause a varying degree of damage or harm to people, plant, materials, equipment, or the environment, with either short or long term adverse effects for a company. But there is a mistake all too often made with regard to incident management and the tracking of incidents within a company. And that mistake is in the seeming singularity of those two words – ‘incident’ and ‘management’. Incident management is not a singular, stand alone component within an existing management system. Too often that is how EHS/safety management teams relate to incident management, i.e. as if it were a systemic end in itself. But it is not. Rather, in order for incident management to be effective and meaningful it must be viewed and managed within its greater whole, namely that of non-conformance management. Take this example by means of an explanation: a forklift driver loses control of his forklift in an electronics warehouse and veers into a stack filled with electronic goods and equipment, causing the stack to catastrophically collapse and goods and equipment to come crashing down on top of the forklift and into the adjacent aisle. The driver is lucky to escape with minor bruises, but there is hundreds of thousands of dollars of damage caused. Is it enough to call this an incident, even a ‘serious’ incident, and to act accordingly within those confines? It is contended here that such an approach is too limited. Instead, one should go further, treating the incident as something more fundamental – that is, as a major non-conformance. But not considered a ‘major non-conformance’ because the driver was maybe driving too fast or was unsupervised in the warehouse, which were indeed unacceptable contraventions of existing safety procedures, or because there was so much damage to property. No, it must be considered a major non-conformance to the very safety management system for that warehouse. It is the system that has been ‘assaulted’ by this incident, so to speak, not merely procedures or the dollar value of merchandise and property. The incident is but an indicator of the level of conformance to a system – no more and no less. Hence the difference. This may be considered the EHS management equivalent of splitting hairs or mere semantics, but it is not. It’s critically important as it defines a difference in mindset which places a management system in its correct place – i.e. front and center. 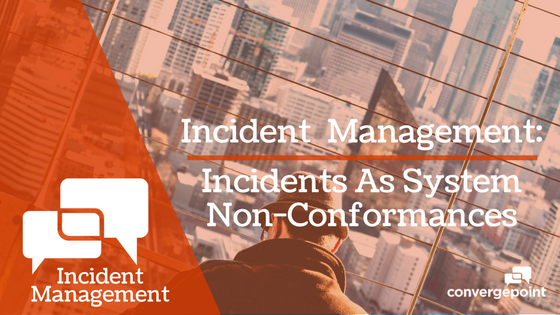 Every time there is an incident, whether serious or minor, it must be instantly addressed within the scope of non-conformance to the broader, larger system. To assess that a forklift driver caused an accident due to a lack of supervision is easy. To delve into the reasons why there was a lack of supervision and the knock-on causes and effects throughout a management system is far more challenging – and should render far better outcomes. It’s simple: incident management is an important part of which non-conformance management is the whole. Therefore, incident management must occur within the sphere of non-conformance management. To not do so is to inadvertently isolate the incident and fails to give it the more important recognition of how it has impacted on a company’s day-to-day and overall EHS performance. Calling it an ‘incident’ defines what occurred. Calling it a non-conformance gives it all-important context.